USA, Jan 12, 2019 : Tulsi Gabbard, the first Hindu ever elected to US congress, is running for the White House in 2020, and could end up vying with Kamala Harris, who is likely to run also, for the affection, support and, most importantly, the financial backing of the country’s richest ethnic community, Indian Americans HindustanTimes reported. “I have decided to run and will be making a formal announcement within the next week,” Gabbard told a CNN TV news anchor for a show that airs Saturday. 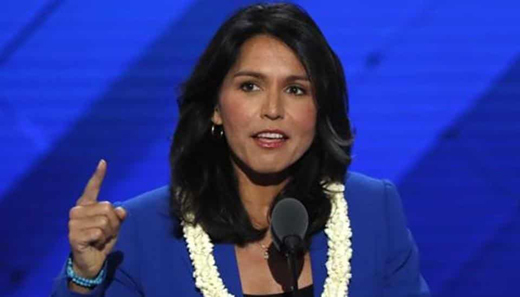 Gabbard, 37, is a US army veteran and a three-term member of the US House of Representative from Hawaii, where the 44th president of the United Sates Barack Obama was born and raised and where he would vacation with his family every major holidays. Obama, now the elder statesman of the Democratic party has not endorsed Gabbard or Harris or any one of the 15 or more Democrats considering a presidential run, to go up against President Donald Trump in 2020. And Harris is an Indian American from her mother’s side and African American from her father’s. There has been some disquiet among Indian Americans about Harris as she has sought to project herself as an African American. “Not sure if the country is ready for another African American,” said an Indian American Republican donor and strategist, who said he would like Harris to devote more time burnishing her credentials as an Indian American. Gabbard will become the first Hindu to run for the White House when she announces formally next week. Though not Indian American, Gabbard is often considered one by the community because of her professed religion — a Hindu — and there stories that Hindu temples in the Washington-Maryland-Virginia region chimed their bells to coordinate with her swearing in in 2012. Gabbard is not Indian American, once again, but is often thought of one, being a Hindu. And if she does decide to run, as she has indicated she will next week, she will make history as the first Hindu, from a tiny religious minority.